AAEE rewards its members for their significant efforts in the areas of environmental education and education for sustainability. We recognise these efforts through the national environmental awards, including the annual Environmental Educator of the Year Award and the biennial Brian Foreman Scholarship and Fellowship of AAEE awarded at the national conference. View the Award details and past recipients below. Each Chapter is encouraged to nominate a member who has achieved significant outcomes within their groups’ work in support of Education for Sustainability. 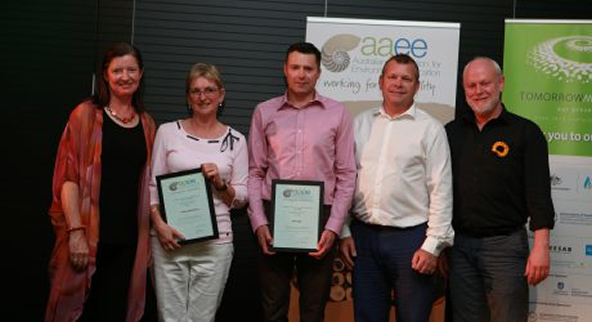 AAEE Executive and the Award Recognition Committee invite nominations from Chapters for the 11th Annual Award for Outstanding Contribution to Environmental Education in Australia. The Award is presented to an AAEE Member who has made an exemplary contribution to the field of environmental education. Prior Chapter nominations can be entered again. Nominations Closed 17 September 2018. Congratulations to Jenny Dibley – the 2018 AAEE Environmental Educator of the Year! L-R: Jenny Dibley, Jennifer Pearson and Mark Caddey celebrate the AAEE 2018 EE Award. Jenny is recognised as a leader in her field, particularly through her involvement in the development of the NSW Environmental Education Policy for Schools and the Australian Sustainable Schools Initiative (AuSSI). Jenny signed up all ACT schools (government and non-government) to Actsmart Schools. ACT is the only jurisdiction in Australia to have all schools registered with the program. Jenny’s commitment to sustainability education has not been confined to her paid work. As President of the Sydney West Branch of the ATA (Alternative Technology Association), based at the Hawkesbury Campus of Western Sydney University (WSU), a position she has held for over ten years, Jenny organises speakers and workshops and has created the Hawkesbury Sustainability Lecture Series. She has been actively involved in Sustainable House Day since it commenced and responsible for the promotion and opening of an environment centre (EarthCare) located at Western Sydney University (WSU) each year. She has been involved as a volunteer at the Centre for over 20 years. The Brian Foreman Scholarship was created to assist a member of the association to travel and attend the biennial conference. Brian Foreman was a founding member of the Association in 1980 and his work in South Australia is legendary. This award is in recognition of Brian’s contribution to environmental education in general and to AAEE in particular. Read Brian’s Story. Nominations Closed 3 June 2018. Applications for the Brian Foreman Scholarship Award 2018 have closed and will reopen in 2020. Applicants must be a current AAEE member and are invited to submit a one page submission. Awarding the 2016 Environmental Educators of the year at the 2016 AAEE Biennial Conference in Adelaide. L to R: Sue Martin (Awards Coordinator), Noeleen Rowntree - QLD (Award recipient), Allen Hill Tas. (Award recipient), Mark Caddey (AAEE President) and Hugh Kneebone (Conference Convenor). "As an Environmental Educator I am privileged to work in an industry that is committed making changes in a variety of forums. In my day-to-day work I come into contact with academics in the field as well as classroom teachers. There is a natural synergy between the work I do with Deakin University and the work I do with Environmental Education Victoria, as it affords me the ability to see theory and practice combine." After a brief interval, the Fellowship of AAEE was reinstated in 2012 to recognise a member who had made an outstanding contribution to environmental education at a national level over their career. This recognition is the awarded by the Executive Committee. Our past recipients are still very involved in the field of Education for Sustainability. This year at the AAEE 2018 Conference we recognised Professor Bob Stevenson as an AAEE Fellow. Prof Stevenson is a Research Leader (Education for Sustainability) at The Cairns Institute, Director of the Centre for Research and Innovation in Sustainability Education at JCU and is Executive Editor of the Journal of Environmental Education (the oldest journal in the field). Professor Stevenson’s research has focused on theory-policy-practice relationships in environmental sustainability education and its history and marginalised status as an educational reform in K-12 schooling. He has critically examined international and national policies and discourses and has developed seminal explanations of the discrepancies between policies and practice in environmental education, arguing for more inclusive and participatory approaches to policy formulation. His current research interests centre on the current and potential sites of learning about issues of environmental sustainability by young people and how schools, peers, electronic media and the home, are being used and can be constructively used to work toward a more sustainable and just society.